The Government Accountability Office’s new retirement analysis reviewed nine studies conducted between 2006 and 2015 by a variety of organizations and concluded that generally one-third to two-thirds of workers are at risk of falling short of their retirement savings targets. However, many of these studies use a “replacement rate” standard: Most commonly, this analysis concludes that you need to replace 70–80 percent of your preretirement income to be assured of a successful retirement. This is a convenient metric to use to convey retirement targets to individuals—and no doubt provides useful information to many workers who are attempting to determine whether they are “on-track” with respect to their retirement savings and/or what their future savings rates should be. However, replacement rates are NOT appropriate in large-scale policy models for determining whether an individual will run short of money in retirement. Why? In fact, looking at just the first two risks above, if you use a replacement rate threshold based on average longevity and average rate of return, you will, in essence, have a savings target that will prove to be insufficient about 50 percent of the time. Of course, this would not be a problem if retirees annuitized all or a large percentage of their defined contribution and IRA balances at retirement age; but the data suggest that only a small percentage of retirees do this. In contrast, EBRI has been working for the last 14 years to develop a far more inclusive, sophisticated, realistic—and, yes, complex—model that deals with all these risks. It’s our Retirement Security Projection Model® (RSPM), and produces a Retirement Readiness Rating (basically, the probability that a household will NOT run short of money in retirement). Our most recent Retirement Readiness Ratings by age are shown in Figure 1 (left). 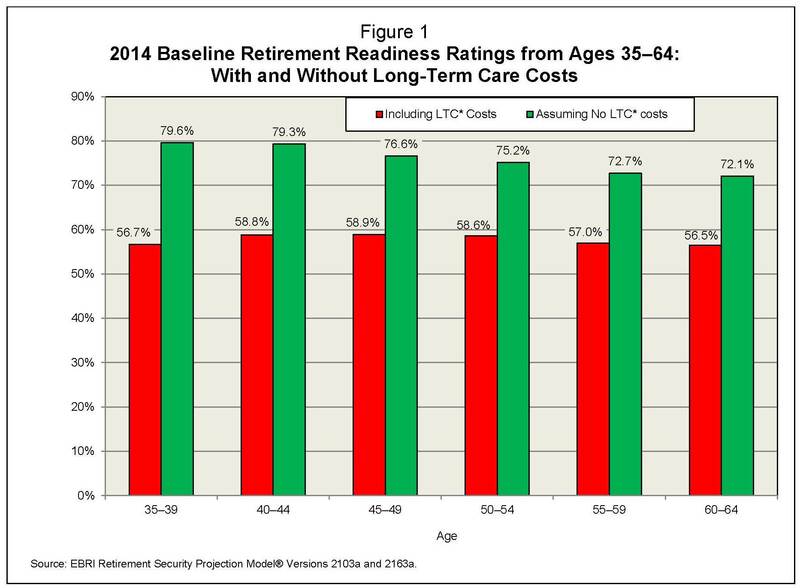 Our baseline results do include long term care costs (the red bars), but we also run the numbers assuming that these costs are NEVER paid by the retirees (the green bars). This latter assumption is not likely to be realistic for many retirees, but we include it to show how important it is to include these costs (unlike many other models). Even more important is Fig. 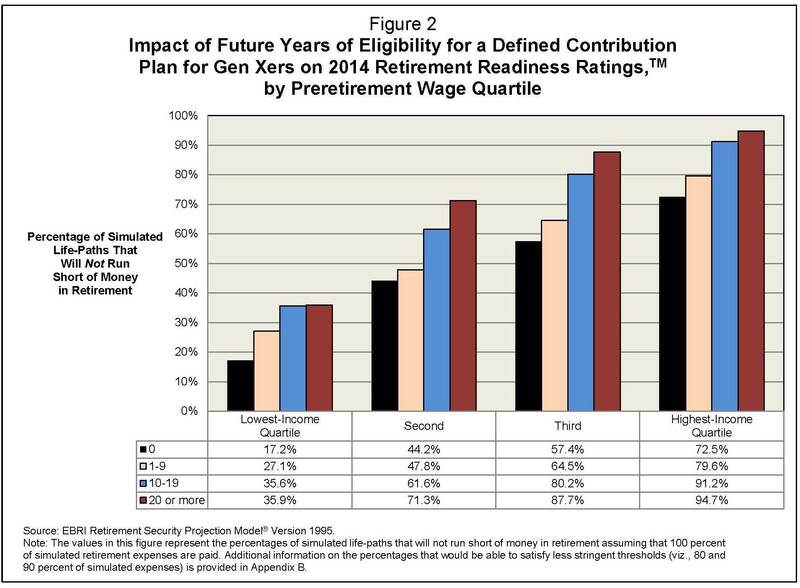 2 (right), which shows Retirement Readiness Ratings as a function of preretirement income AND the number of future years of eligibility for a defined contribution plan for Gen Xers. Even controlling for the impact of income on the probability of a successful retirement, the number of future years that a Gen Xer works for an employer that sponsors a defined contribution plan will make a tremendous difference in their Retirement Readiness Ratings (even with long-term care costs included). The evidence from EBRI’s simulation modeling certainly agrees with the GAO that a significant percentage of households will likely run short of money in retirement if coverage is not increased. However this is because we model all the major risks in retirement and do not simply assume some ad-hoc replacement rate threshold. Moreover, using an aggregate number to portray the percentage of workers at risk for inadequate retirement income is really missing the bigger picture. The retirement security landscape for today’s workers can be bifurcated into those fortunate enough to work for employers that sponsor retirement plans for a majority of their careers vs. those who do not. In general, those who have an employer-sponsored retirement plan for most of their working careers appear to be well on their way to a secure retirement. Perhaps the focus of any retirement security reform going forward needs to be on those who do not work for employers offering retirement plans and those in the lowest-income quartile. 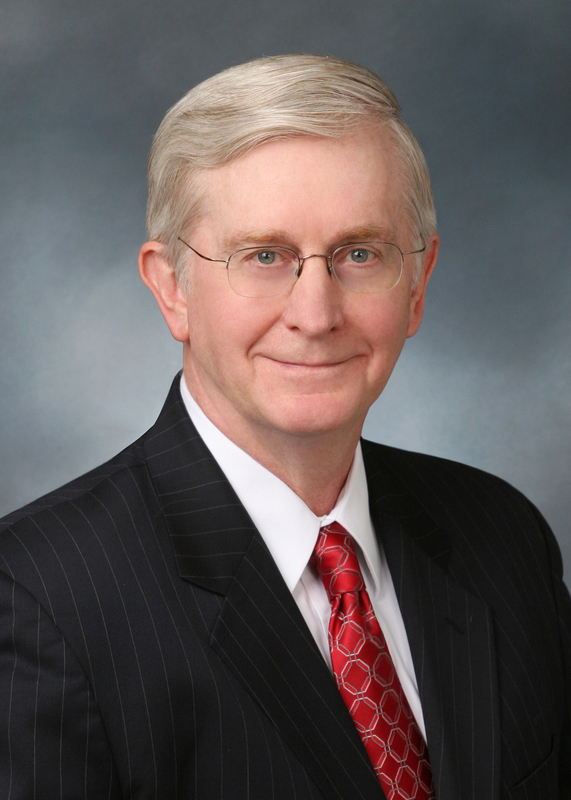 Jack VanDerhei is research director at the Employee Benefit Research Institute. My wife and I recently celebrated our wedding anniversary. It was a special day, as they all are, but as I thought back on the events of our life together, I was struck by the realization that I have now been married for about half my life. Not that I didn’t expect to remain married, or to live this long; if someone had asked on my wedding day if I thought I’d still be alive and married this many years hence, I’m sure that I would have expressed confidence, likely strong confidence, in both outcomes. However, if someone on that same day had asked me to guess then where I would be living now, what I would be doing, or what my income would be (or need to be)—well, my responses would likely have been much less certain. In just a few weeks we’ll be making preparations to launch the 2015 Retirement Confidence Survey (RCS)[i]. It is, by far, the longest-running survey of its kind in the nation. Indeed, this will be its 25th year. Think for a moment about where you were a quarter century ago, what (or if) you thought about retirement, what preparations you had made… then consider for a moment what you have done in the years since. Are you where you thought you would be? Are you more – or less – confident about your prospects for a financially secure retirement? Have you planned toward a specific retirement date or age? Has that changed over the years – how, and why? Through the prism of that near-quarter-century window, the RCS provides a unique perspective to view in the here and now, and to look back over time on how American workers – and retirees – have viewed their preparations, readiness, and confidence about retirement. It has also provided those who are working to help improve and/or ensure those prospects insights into those collective preparations, or lack thereof. Moreover, the RCS has offered the ability to gauge potential responses to specific regulatory, administrative and legislative alternatives, both real and envisioned – a critical real-world filter to balance the theoretical world in which academics often imagine we live and respond, or as they often assume, won’t respond[ii]. Retirement confidence is, of course, a state of mind at a point in time, unique to individual situations, and as past waves of the RCS have shown, it’s not always based on a realistic assessment of where you are or what lies ahead. That said, the RCS offers more than a sentiment snapshot, and those who look not only to feel better about retirement but to have a basis for that feeling need look back no further than the pages of that report. The RCS has outlined the impact that real-world actions can have on confidence: having saved for retirement, having sought professional investment advice, having made a determination as to how much is needed for retirement, and – as last year’s RCS findings emphasized — having some kind of retirement savings account. Little wonder that those who have undertaken those steps are more confident of the outcomes. It’s one thing to anticipate that eventual cessation of paid employment, and something else altogether to make the preparations – to choose to save – and to be confident that you’ll be able to look back with satisfaction one day knowing that you have the financial resources to enjoy it. Your organization can be part of the 25th Retirement Confidence Survey. Survey underwriters serve as a member of the survey’s Advisory Board, along with the opportunity to participate in the review and update of the 2014 questionnaire; have the opportunity to participate in a pre-release, underwriters’ briefing on the results of the survey; are able to utilize the survey materials and findings for your research, marketing, communications, and product-development purposes – and you’ll be acknowledged as an underwriter of this, the 25th Retirement Confidence Survey, among other benefits. For more information, contact us at nadams@ebri.org. [i] More information about the Retirement Confidence Survey is available online here. While the prospects for “comprehensive tax reform” may seem remote in this highly charged election year, the current tax preferences accorded employee benefits continue to be a focus of much discussion among policymakers and academics. However, one of the more pervasive assumptions, particularly when it comes to modeling the impact of policy and/or tax reform changes, is that, regardless of the size and scope of the changes proposed, workers – and employers – will generally continue to do what they are currently doing, and at the current rate(s), for both contributions and/or plan offerings. Consequently, there is talk of restricting participant access to their retirement savings until retirement, with little if any discussion as to how that might affect future contribution levels, by both workers and employers, and there are debate about modifying retirement plan tax preferences as though those changes would have no impact at all on the calculus of those making decisions to offer and support these programs with matching contributions. Ultimately, these behavioral responses might not only impact the projected budget “savings” associated with the proposals, but the retirement savings accumulations themselves. The impact of permanently modifying the exclusion of employer and employee contributions for retirement savings from taxable income, among other proposals[iv]. While we can’t be certain what the future brings, considering the likely responses to policy changes is a critical element in any comprehensive impact assessment – not only because the status quo is rarely a dependable outcome, but because, after all, those who assume the status quo are generally looking to change it. [i] From Urban Institute and Brookings Institution: Flattening Tax Incentives for Retirement Saving: “Our findings should be interpreted with caution. Actual legislation for flattening tax incentives requires more than the simple adjustments discussed here. For instance, if a credit-based approach is used, then the laws would need to ensure some recapture of those benefits for those who made contributions one year and withdrew them soon thereafter. I’ve been hooked on the convenience of GPS systems ever since the first time one was included in the price of a rental car on a family trip in unfamiliar territory. After all, it combines the opportunity to tinker with electronic gadgetry alongside the convenience of not having to do much in the way of pre-planning trip routes—not to mention avoiding the need to stop and ask for directions (that is frequently associated with not doing much in the way of pre-planning trip routes). There are, of course, horror stories about drivers who have blindly followed GPS instructions without paying attention to the evidence of their eyes. My family still chuckles at the memory of a trip where we were running late to our plane, and the rental car GPS, based on what appeared to be an outdated address for the return office, kept directing us to an address that was not only miles from the real office, but a place from which I wondered if we might never return. As a growing number of Americans near, and head into, retirement, policymakers, retirement plan sponsors, and individual workers alike increasingly wonder—will Americans have enough to live on when they retire? Unfortunately, as a recent EBRI publication explains, the answers provided are as diverse, and sometimes disparate, as the projection models that produce those results. While it is not always clear from their results, some of those models limit their analysis to households already retired, while others focus on households still working, but old enough that reasonably accurate projections regarding their future wages and prospects for accumulating retirement wealth are obtainable. Still others attempt to analyze the prospects for all working households, including those whose relative youth (and distance from retirement) makes accurate, long-term predictions somewhat problematic. Moreover, there are varied definitions of retirement income adequacy. As the EBRI report explains, some either (1) model only the accumulation side of the equation and then rely on some type of preretirement income replacement rate measure as a threshold for success, or (2) make use of a so-called “life-cycle” model that attempts to smooth/spread some type of consumption-based utility over the decision-maker’s lifetime. The problem with the former is that, since very few households annuitize all (or even most) of their individual accounts in retirement, a replacement-rate focus overlooks the potential risk of outliving their income (longevity risk). And while the annuity purchase price relied upon in a replacement-rate target does depend on an implicit assumption with respect to (at least some) future market returns, it does not typically account for the potential investment risk. Additionally, and as previous EBRI research has demonstrated, one of the biggest financial obstacles in terms of maintaining retirement income adequacy for households that might otherwise have sufficient financial resources at retirement age is the risk of long-term care costs for a prolonged period. In the real world, few retirees have long-term care insurance policies in place that would cover the potentially catastrophic financial impact of this exposure—and thus, simply adding the cost of long-term care insurance into a replacement-rate methodology will vastly underestimate the potential severity of this exposure. As for the life-cycle smoothing model, the EBRI report notes that approach typically produces extraordinarily low levels of “optimal” savings for low-income individuals at retirement, and while some households may, in fact, have no choice but to subsist at those levels in retirement, from a public policy perspective EBRI chose instead to establish a threshold that would allow households to afford average expenditures (for retirees in the appropriate income category) throughout their retirement, while at the same time accounting for the potential impact of uninsured long-term care costs. EBRI’s Retirement Security Projection Model® takes a different—arguably unique and more realistic—perspective. Rather than relying on an individual’s projected ability to achieve an arbitrarily designated percentage of his or her preretirement income as a proxy for retirement income adequacy, RSPM grew out of a multiyear project to analyze the future economic well-being of the retired population at the state level, focused on identifying the point at which individuals would run short of money and perhaps become a financial obligation of the state. As valuable a resource as a GPS can be, it can quickly become a nuisance—or worse—if the input destination point is incorrect, or the mapping system is out of date. Similarly, those who want a financially secure retirement may find that relying on a model based on flawed assumptions or outdated “destinations” may find themselves short of their goal and with little time to do anything about it. See ““’Short’ Falls: Who’s Most Likely to Come up Short in Retirement, and When?” online here. A brief description of EBRI’s Retirement Security Projection Model® can be found online here. My wife is fond of recounting one of our early dates when we ran out of gas. Now, we were in the heart of a Chicago suburb at the time, not the middle of nowhere, and while the hour was late, I continue to maintain that it was a simple case of my misreading the gas gauge in a relatively new car with which I hadn’t yet gained a full appreciation for just how far I could push such things. My wife, of course, has always accused me of a more “nefarious” purpose. It would be more difficult to explain such an outcome these days. We’ve gone from vehicles that simply had a floating gauge and a range of red at the 1/8 tank line, to those that have a solid and then a blinking yellow light, to ones that beep and flash and tell you how many miles you have left before you run out. As inconvenient as running out of gas late at night can be, it surely pales in comparison to the prospects of running short of money in retirement. EBRI has, for more than a decade now, used highly sophisticated modeling techniques to gauge the retirement readiness of baby boomers and Gen Xers. One of the primary outputs of EBRI’s Retirement Security Projection Model (RSPM)[i] is the production of Retirement Readiness Ratings (RRRs), which represent the percentage of simulated life-paths that do not run short of money in retirement. The 2014 version of RSPM found that over half of baby boomer and Gen Xer households would not run short of money in retirement. However, when the results were analyzed by preretirement wage quartile, we found that while 86.4 percent of the highest income quartile were projected to not run short, just 16.8 percent of the lowest income quartile would not. While it is useful, certainly from a public policy perspective, to know not only how many but also what types of individuals are projected to run short of money in retirement, it begs the question: when will they run short? A recent EBRI Notes article[ii] provides new results showing how many years into retirement baby boomer and Gen Xer households are simulated to run short of money, by preretirement income quartile and for a variety of assumptions, as well as taking into account the impact of the potentially catastrophic expenses of nursing home and home health care expenses. Not surprisingly, it finds that those in the lowest income brackets are most likely to run short. Moreover, while some in all income brackets—including the highest—may run short at some point during their retirement, the EBRI analysis also found that, when nursing home and home health care expenses are factored in, the number of households in the lowest income quartile that are projected to run short of money within 20 years of retirement is considerably larger than those in the other three income quartiles combined. The EBRI analysis provides valuable insights for policymakers, providers and employers alike because, whether you’re concerned about running out of gas short of your destination – or short of money in retirement – it’s important that your gauges be accurate, and appropriate to the vehicle in which you’re riding there. [i] A Brief Description of EBRI’s Retirement Security Projection Model® is available here. [ii] The June EBRI Notes article, ““Short” Falls: Who’s Most Likely to Come up Short in Retirement, and When?” is available online here. Individual retirement accounts (IRAs) have been around a long time – since the Employee Retirement Income Security Act of 1974 (ERISA), in fact[i]. Today IRAs represent nearly $6 trillion in assets, approximately a quarter of the $23.7 trillion in retirement plan assets in the nation. As an account type, they currently hold the largest single share of U.S. retirement plan assets with, as a recent EBRI publication notes, a substantial (and growing) portion of these IRA assets having originated in other tax-qualified retirement plans, such as defined benefit (pension) and 401(k) plans. Recognizing not only the significant growth but the increasing importance of these accounts to individual retirement security, the Department of Labor has proposed expanding ERISA’s fiduciary protections to these accounts. To help better understand the trends driving this critical retirement savings component, the EBRI IRA Database, an ongoing project that collects data from IRA plan administrators across the nation, was created. For year-end 2012, it contained information on 25.3 million accounts owned by 19.9 million unique individuals, with total assets of $2.09 trillion. The EBRI IRA Database is unique in its ability to track individual IRA owners with more than one account, thereby providing a more accurate measure of how much they have accumulated in IRAs. For example, a recent EBRI analysis[ii] notes that the average IRA account balance in 2012 in the EBRI IRA database was $81,660, while the average IRA individual balance (all accounts from the same person combined) was $105,001. Overall, the cumulative IRA average balance was 29 percent larger than the unique account balance. While almost 2.4 million accounts in the EBRI IRA database received contributions in 2012, compared with the 1.3 million accounts that received rollovers for that year, the amount added to IRAs through rollovers was 10 times the amount from contributions. However, an annual-snapshot percentage of IRA contributions doesn’t show whether the same individuals were contributing over time, or if different people contributed in different years. Taking advantage of the ability to look at multiple years across multiple accounts of individual owners across the EBRI IRA database, the report notes that while approximately 10 percent of traditional IRA owners contributed at some point during the three-year period, only 6 percent contributed to their IRA each year. On the other hand, while approximately 25 percent contributed to their Roth IRA in any one year, 35 percent did so at some point over the three-year period. Looking at the pace of contribution activity, the EBRI analysis found that among those who contributed to their IRA in each of the three years, the pattern seemed pretty consistent: 12.1 percent did so in 2010, 13.2 percent in 2011, and 13.1 percent in 2012. Looking at the specific sources of those contributions, among traditional IRAs, we find that the percentage that contributed to them rose from 5.2 percent in 2010 to 6.6 percent in 2012 – but among Roth IRA owners, 24.0 percent contributed in 2010, 26.0 percent in 2011, and 25.1 percent in 2012. Consider too that, among traditional IRA owners, only 3.0 percent contributed all three years, compared with 15.0 percent of Roth IRA owners who did so. Moreover, Roth IRA owners ages 25–29 were the most likely to contribute in any year and all three years (56.1 percent and 24.3 percent, respectively). Indeed, more than 4 in 10 (43 percent) Roth owners ages 25–29 contributed to their Roth in 2012. The EBRI analysis found significant differences in the distribution patterns among older IRA owners, specifically those ages 70 or older, due to the required minimum distribution (RMD) rules. Those rules require individuals to begin making withdrawals from traditional IRAs starting April 1 of the year following the calendar year in which they reach age 70½. However, the RMD rules do not apply to Roth IRAs, a factor that likely explains the continued increases in account balances for Roth owners in that age group. In sum, while the gross accumulations of retirement savings in IRAs provide value in terms of quantifying an increasingly significant component of the nation’s retirement security, a focus that takes into account only aggregate movements, or isolated account holdings, one that ignores the original source(s) of the money in the account, and/or the accompanying restrictions, runs the risk of overlooking significant undercurrents. Undercurrents that may provide a better understanding of the growth trends in this important savings vehicle and ultimately, of course, explain how – and when – these retirement savings are withdrawn. [i] Originally designed as a means to provide workers who did not have employment-based pensions an opportunity to save for retirement on a tax-deferred basis, IRAs have undergone a number of changes over time. The Economic Recovery Tax Act of 1981 (ERTA) extended the availability of IRAs to all workers with earned income (including those with pension coverage), while the Tax Reform Act of 1986 (TRA ’86) brought with it some restrictions on the tax deductibility (and, in some cases, availability) of IRA contributions. A decade later the Taxpayer Relief Act of 1997 (TRA ’97) created a new type of nondeductible IRA—the Roth IRA—and allowed nonworking spouses to contribute to an IRA, subject to certain income restrictions. [ii] The May 2014 EBRI Issue Brief, “Individual Retirement Account Balances, Contributions, and Rollovers, 2012; With Longitudinal Results 2010–2012: The EBRI IRA Database,” is available online here. A frequent criticism of the 401(k) design is that it was “never designed” to provide a full retirement benefit, unlike, as it’s often stated or implied, the defined benefit plan. Moreover, while there is a very real tendency to focus on the CURRENT balance[i] in a defined contribution/401(k) plan and treat that as the ultimate outcome, for reasons I’ve never really been able to understand, people tend to think and talk about defined benefit (DB) plans in terms of the benefit they are capable of providing, rather than the actual benefits paid. Once upon a time, everybody had a pension. The reality is that more private-sector workers are participating in a workplace retirement plan today than in 1979. People used to work for the same employer their whole careers. My kids think their generation is the first to anticipate having many employers during their careers, but the reality is that American workers, certainly in the private sector, have long been relatively mobile in the workforce. Median job tenure of the total workforce has hovered at about five years since the early 1950s (in fact, as EBRI’s latest research points out, the average median job tenure has now risen, to 5.4 years). [ii] The data on employee tenure—the amount of time an individual has been with his or her current employer—show that career jobs never existed for most workers and have continued not to exist for most workers. And that has implications for pension benefits. Everybody who had a pension got a full benefit. Those who know how defined benefit plan accrual formulas work understand that the actual benefit is a function of some definition of average pay and years of service. Moreover, prior to the mid-1980s, 10-year cliff vesting schedules were common for DB plans. What that meant was that if you worked for an employer fewer than 10 years, you’d be entitled to a pension of … $0.00. As noted above, the American workforce has, since the end of World War II, been relatively, and consistently, mobile. Between 1987 and 2012, among private-sector workers, fewer than 1 in 5 have spent 25 years or more with one employer. Under pension accrual formulas, those kinds of numbers meant that, even among the workers who were covered by a traditional pension, many would actually receive little or nothing from that plan design. And that’s for those who were covered in the first place[iii]. People used to get more retirement income from pensions than they do today. There are undoubtedly different challenges ahead for retirees than for prior generations – longer lives, higher health care costs, the pressures of affording long-term care – but when it comes to sources of retirement income for those over the age of 65, there has been remarkably little change over the past several decades. Social Security is and has been a consistent source, representing somewhere between 40 and 45 percent of aggregate income (excluding non-periodic distributions from DC plans and IRAs) during most of that time, and into the current time, according to data from the Census Bureau. Pension annuity income, which constituted about 16 percent of aggregate income in 1976, rose to as high as 21 percent in the early ’90s – about where it stands today. There’s no question that some Americans in the private sector have derived, and will continue to derive, significant retirement income from DB plans, and DB plans did and can deliver for the portion of the population that does stay with one employer/plan for a full career[iv]. The data show, however, that many Americans were not covered by those plans, even in the “good old days,” and that even many of those who were covered, for a time anyway, were not likely to receive the full benefit that the design was capable of delivering because they didn’t have, or take advantage of, the opportunity. [iii] Expectations for pension benefits appear to exceed the reality, even among workers. The 2014 Retirement Confidence Survey found that while 56 percent of workers expect to receive benefits from a defined benefit plan in retirement, only 31 percent report that they and/or their spouse currently have such a benefit with a current or previous employer. See here. EBRI Perspectives serves to supplement EBRI’s regular publications, and allows EBRI to provide observations based on our research, as well as on questions that we get from news reporters, policymakers, and others. Ballpark Estimate An easy-to-use, two-page worksheet that helps you quickly identify approximately how much you need to save to fund a comfortable retirement.